The glorious history of Tibetan empire had sustained and nurtured the Tibetan people. During the height of its power, the Tibetan empire extended nearly the half of Asia – from the then Chinese capital city of Chang’an in the east to the Gangetic plains of India in the South, and to the Oxus River in the west. The hoofs of cavalry from the high plateau have left an indelible imprint over these territories. Tibet even controlled the Silk Route, emerging as a bridge between the Eastern and Western worlds and a major hub of trade and civilization. Tibetan people possess the spirit of rebellion. During the imperial time, when the masses suffered atrocities due to unjust rule and heavy taxation, they, in alliance with the military, revolted against Tibetan kings. They even ransacked the royal tombs at Chongye, distributing the treasures buried therein among themselves. Tibetan people have the willpower to revive the glory of Tibetan civilization. After the political disintegration of Tibet, the fire of Tibetan Buddhism kept burning in eastern Tibet. The learned Panditas and Lotsawas travelled to India, China and other countries to bring in their cultures, thus reviving the Tibetan civilization. These efforts enabled great advances in Tibet’s political, economic and cultural fields. The Tibetan people have the ability to seize opportunity for political changes. The one who can seize such an opportunity in accordance with changing times is a true leader. In the recent history of Tibet, there were several proud events such as the expulsion of Chinese invaders from Tibet. His Holiness the Great Thirteenth Dalai Lama, taking advantage of the downfall of Manchu dynasty in China, not only expelled all the Chinese from Central Tibet but also reiterated the independence of Tibet in 1913, thereby rendering unimaginable service to the Tibetan people. Tibetans are the first to revolt against Mao’s China. In the 1950s, Tibetans from Dotoe, Domey and Utsang launched both peaceful and armed struggle against the invading PLA forces. Although the Chinese eliminated leaders of the Tibetan government, including those that attempted to cooperate with them, Tibetans continued to revolt, culminating in the Tibetan National Uprising on 10 March 1959. Tibetans have never surrendered to the occupying Chinese. In early 1980s, a new generation of Tibetans rose up against the Chinese colonizers in Tibet’s capital Lhasa. In 2008, a new chapter was opened in the Tibetan freedom movement as Tibetans from across the entire Tibetan Plateau rose up against the Chinese. Nearly 150 Tibetans who have self-immolated so far are at the forefront of this new movement. Tibetans are fiercely independent in nature and self-sufficient. Tibetans in exile are doing quite well because of the hard work of the older generations. Refugee settlements in India, Nepal and Bhutan are functioning well and young Tibetans, who are decently educated, are able to face the challenges of the modern world and walk shoulder to shoulder with other people. Lack of long-term vision has obstructed political reforms. We need to change the political status quo and to wake up from this inferior attitude of having lost our nation and having to face existential uncertainty in exile. I don’t believe that change will emerge out of the coffers of a rich merchant. I don’t believe that change will come from the prayer of a hermit meditating in a cave. I don’t believe that change will be ushered-in by anyone just because he or she has a degree from a western university. Political reform can only be achieved when we imbibe the wisdom and fortitude of our forefathers and the spirit of the Great Emperors of Tibet. However, if we forfeit our collective wisdom and espouse the knowledge of others while aping the western culture in all our works, we will never be able to rise up for freedom. Even if we do manage to rise up, we will not be able to build a Tibet that is the true spirit of Tibet or one that is truly suitable for Tibetans. As human beings, exile Tibetans have had instances of disagreements between various groups. Ideally, CTA should have been able to maintain a fair and balanced stand on minor issues and conflicts within our community. However, occasionally we have made mountains out of molehills. Cases in point are the dissension between the old and the new Chushi Gangdruk, the issue regarding propitiation of Dolgyal and the recent fiasco in New York where a few so-called supporters of the Middle Way Approach warned other Tibetans chanting pro-independent slogans that they would be handed over to the police. In such instances the exile administration should have shown visionary and non-partisan leadership. We must eliminate our servitude mindset. Chinese propaganda alleges that the barbaric and backward Tibetans will never make progress without the leadership of the Chinese Communists. In exile some of us, as if to augment this Chinese narrative, preach that Rangzen is unrealistic and that Tibet will profit if we remain under China. This is tantamount to reinforcing our servitude mindset. The other form of servitude mindset prevalent in exile is the failure to identify those people who talk about honesty and integrity yet engage in corrupt acts. Although we know those unscrupulous people yet we look the other way. If we fail to overcome these forms of servitude mindset, we will never be able to rise up. The perversion of faith has sown seeds of discord in our exile society. With the progress of civilization, we hoped that the discords between different religious traditions would subside. However, as elsewhere around the world, tensions within our exile society seems to have risen. There have been cases of murder due to contention in propitiation of deities or demons. In the past few years, many of those who practice Dolgyal and those who allegedly oppose them have unabashedly washed their dirty linens in the public, creating a sad spectacle. The harmful repercussions of such actions have gradually emerged in Tibet as well. As of now, it is not the exile administration’s role to interfere in the dispute between deities or demons. Instead it must take steady and careful steps in restricting the perversion of faith, which is destroying the foundations of peace and unity within our society. In the history of Tibetan democracy, His Holiness the Dalai Lama’s decision to devolve his political responsibilities was historic. However, those who inherited the precious gifts of democracy from His Holiness, seem to have forgotten their responsibility to restore Tibet’s freedom as soon as they entered the gates of Gangchen Kyishong. They forget that Gangchen Kyishong is not Lhasa. Due to their ignorance about ground-shifting changes taking place in Tibet, the exile leaders fail to respond actively when protests take place inside Tibet. 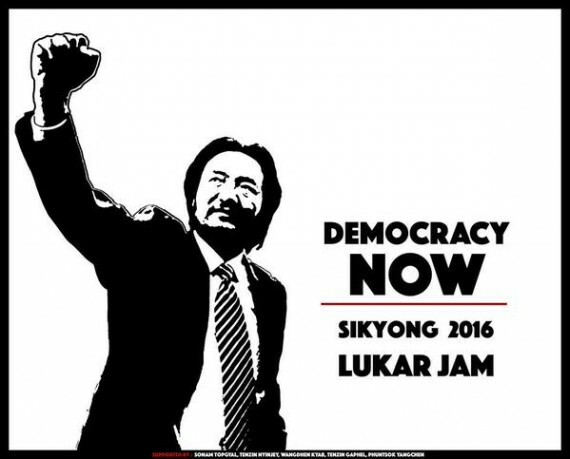 I am standing for the Sikyong elections not because it is about winning or losing. Rather it is about its significance. I have to enter this election. This is not just an act of protest but because we need concrete reforms and a new vision. Long Live Tibetan Independence! Long Live Tibetan courage! Long Live Tibet!